This entry was posted on Monday, April 15th, 2019 at 6:23 am and is filed under Uncategorized. You can follow any responses to this entry through the RSS 2.0 feed. You can leave a response, or trackback from your own site. Deeney is no more than a wooden horse…..I’m looks anyway. Thanks Chas. Our away form and mindset must change one day. Please Gunners dont spoil another week. in looks, in looks in looks…..
Ah, this just appeared on twitter and is the goal mentioned by GN5 in his DB10 post yesterday. #OnThisDay in 2006: Highbury celebrates "Dennis Bergkamp Day". A very good pre-match Post, Chas, mucho gracias. Abduct or kidnap are possibilities but as Helen had been given to Troy by the Goddess Aphrodite, and he was as good looking as she was beautiful, so she was ‘well up for it’ and needed no abducting. Your metaphor of Helen of Troy, made think of Troy Deeney, and oddly there is a link. Christopher Marlowe coined the expression about Helen of Troy that, ‘her face launched a thousand ships’ whereas BR said about Troy Deeny that ‘his face launched a thousand quips’. I like the addition of Sue, do the Vines have a sister? Yeah, Sue is a great addition as you say. Fine PM Chas, this is a very sticky fixture. I think that their FA Cup semi win will increase their confidence and make it even tougher for us. Last season was our worst away record in our EPL history W4, D4, L11, Pts16. This season our record is W5, D4, L6, Pts19. Even though our away record is improving it is still our Achilles heel and we need a rapid recovery. April 15th; it’s -5c and it’s snowing! It’s too warm for it to stick but it’s a serious indication that climate change is a reality and it’s a self inflicted injury to the planet – caused by us humans. Time to remove that curse as well. Look, if the green kit is too horrendous, just take it off and bin it. Mind, you might want to wear a bathrobe or summat to the game – could get chilly at the Ems. Each game becomes more ‘must win’ than the last, so I’ll admit to being a little nervy. I hope LBG’s potent version of The Arsenal shows up this evening. Who would have thought that we’d be saying how important Xhaka now is to the team 18 months ago, but I think we really miss his presence in midfield. An early goal would help, but I’ll take a hard earned 1 nil at this stage, although it would be good to improve our GD … who knows whether that will become pivotal at the end of the season … so I’m going for 0:5 …. 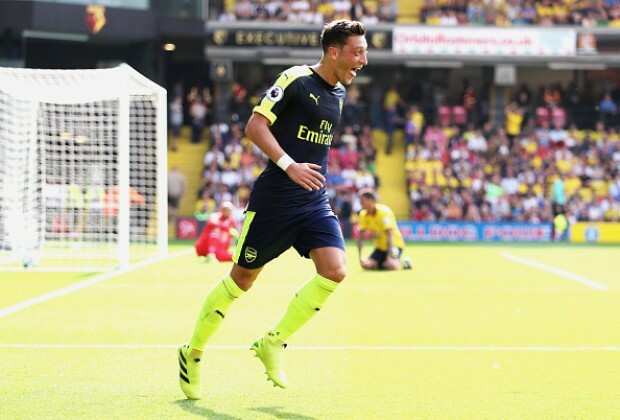 Xhaka and Ramsey … excellent … and another chance to see Mavro …. I’m really looking forward to this now. It seems UE is rotating players to an extent, but relevant to the strengths of the opposition. I am more interested in that team than I thought I would have been — dare I dream of a win? 😳. Me too. I thought Mavro may have not been seen again this season. I do not know why we are playing on a Monday, when we have a European game on Thursday? Would not happen to any of the other top 6. Have we ever won with that horrendous green kit? Looking forward to seeing what Mavropanos can do….must be in there coz he’s a big lad. Hope he has the cojones to match! I forgot to say that I totally agree with you about the green coloured kit. I am not keen on many green colours, – but that kit colour is really not nice. Hi Redders, I’m still at work, but just about to rush to a friend’s house to catch the start of the game. Yes, I agree, it looks like a strong attacking side. Mavropanos was mighty impressive in his last stint in the side and envisioned he and Holding being our future CB pairing. Thanks for the connection Chas. Mav at the back and Xhaka in the squad too. Time to get back on track at Watford like GN5 pointed out in the stats. I genuinely did not realise that the Chavs got caught in the same date problem – makes me feel a bit better that we are not being singled out for rubbish scheduling. Can’t see us winning this tonight. Deemed up against an inexperienced Mavropanos fills me with dread. I hope I’m wrong and the midfield can dominate and get us the win, but put away form suggests we could lose our grip on top 4 tonight. That’s ok RA… I like to keep an eye on things like that as you know we’re not the FA’s darlings!! Ha thank you 😊 No not been on here before, I stumbled across this site not that long ago… love talking about Arsenal… so happy days! The dreaded pass to Leno in the penalty area with each of our players being closed down. And blow me down — Foster gets caught instead!! And cheating Deeney elbows the smallest player on the pitch — and it’s bye, bye. Torreira is so small that it was probably Deeneys ‘cojones’ that caught him in the face. Need to wake up. We’ve scored a lucky goal and one of their players has done something stupid and got himself sent off, yet they are the better team. We just look so poor at passing!! It’s made for Laca or Özil with them having 10. At the moment there is nobody playing between the lines because Auba plays on the last man and Iwobi and Mkhi are staying wide. Would make sense to bring on Laca now and take Mkhi off. Auba on his own is too easy to defend against. I’d put Kola on for Iwobi and Laca on for Mkhi and go 3412 with Laca dropping in to link play with Ramsey and Mustafi and Kola pushing high and occupying their full backs and keep them in their half. We are not keeping the ball or sustaining pressure at all and it’s giving them a chance to nick something. I had to remind myself that Watford were one man down — and not Arsenal. We look so flakey and lacking in confidence. Thank goodness Foster (usually a very good GK) , had a bit of a ‘mare. They have 10 men but we have Micky, I’m afraid. I would bring Mesut on to create chances for Auba — but what do I know? Will be Mesut for either Xhaka or Tor so Rambo and Ozil play in the middle in front of the Hornets’ D and we push them right back into their own half, I reckon. Laca to come on later for Mkhi. If we move the ball any slower it will grow roots. Another good ball from Iwobi. Mkhi is having a stinker. He makes me think more and more about Arshavin. 1The keeping the ball to tire out the opposition requires an end product “dynamic” ball. 2Plus Mustafi and Micky on the right is short on positivity. 3 Worried until we get a second this is set up for an equaliser. Sorry not happy with the mindset. Not sure about that change. Feel like we have too many cooks in midfield now. I would preferred some width instead of Geundouzi. I understand wanting control in the middle but it feels like we’ve gone over the top. How are they getting behind our midfield??? This is so poor. Agreed fgg, that change has weakened us again tactically (nothing against Guendouzi). Emery seems nervy. A golden opportunity for our first away clean sheet may get wasted. Has the referee lost his mind? Foul after foul from Watford and he just lets play go. Shameful. It would make so much sense to also attract referees from the continent. The standards are appalling. I have this weird sense of inevitability that Watford will equalise. And as I typed that AMN saved a certain goal. Evening to you RA – have you got any fingernails left? The changes have been poor. We’ve lost all our energy with Ramsey and Torreira going off and what’s the point of sticking Özil up top as a striker? We’ll be lucky if we win this. Second best throughout to 10 men. 10 man Watford are scalping us! I’d have Doucoure at Arsenal. His energy and work rate is fantastic. I am by nature pretty phlegmatic — but in the last couple of seasons our performances have caused me to fear the worst away. As poor as we’ve been we could’ve had 3 or 4 goals second half. Doucore has the sort of mindset we need. If that was a better half of defending, God help us…..BUT 3 POINTS. THANK YOU. Not pretty but a huge huge win. With Chelsea and United still to play each other and United and Spurs to play Man City we may only need 3 more wins. We utterly lack leadership in defence. Koz leads by example but we also need the calm of Sok. Three big fat points and let’s just move on quickly. In fairness to Watford they played very well, full of guts — altho they dis commit a lot of fouls. I’ll take that, it’s about results now, forget the artistic impression. I very much welcomed the result, the 3 points and the long awaited away clean sheet — but I did not like the performance. I agree, Sue, and the best thing that happened tonight was Deeney being an idiot and getting sent off. I suspect you are right – if he stayed on they would probably have changed the result. I don’t like him, but he is a real handful and our defence playing that way would not be able to hold him. Terrible performance – great result. Oh well it’s done now… moving onto Thursday.. if Napoli watched that, they’ll be rubbing their hands together!! Agree with GN5, Leno and AMN share motm. But, the table never lies, so onward and upward. Hi Sue, I’m glad that you stumbled across AA. Where are you from and how did you start supporting Arsenal? We won ff’ss…..nothing to complain about. Leno, Koz but also Iwobi are good shouts for MOTM. It was criminal that Alex did not end up with an assist or two. I agree Sue our team are a complete Jekyll and Hyde our home and away performances are light years apart. I miss being around in Highbury; living there was an extremely important period in my life.